A Waterfall card one of my favourite styles, I haven't made one for a while so this one is my DT card for the latest challenge over at CD Sunday, the images are from Ooh-La-La, Shoes in Bloom CD, the backing paper is from Bearly Mine Designs, base card is Centura Pearl, the red card is from my stash, I cut the shapes with nestabilities. How pretty. I love the ribbons and the Red on it. Very striking. Thanks for playing at poodles parlour and good luck! What a fantastic waterfall card!!! Love the images you've used, the dp's, the colour scheme is gorgeous. Love the ribbon detail. Just beautiful. Thanks for joining us at The Poodles Parlour and Good Luck. This is lovely. I like the nestie shape behind the topper and the waterfall part, the red draws it all together. Do like this CD too. Thank you for sharing with us at Crafty Ann's this week. Gosh, I have not made one of these for ages either. Gorgeous colours. I like waterfall cards but haven't made one, this is lovely and will bring a big smile to its recipient! Pretty colors and great finishing touches! Thank you for participating so quickly with us at Opus Gluei! This is wonderful! I have only done one waterfall card years ago at a class. I must try making another one soon! Thanks so much for inspiring me! 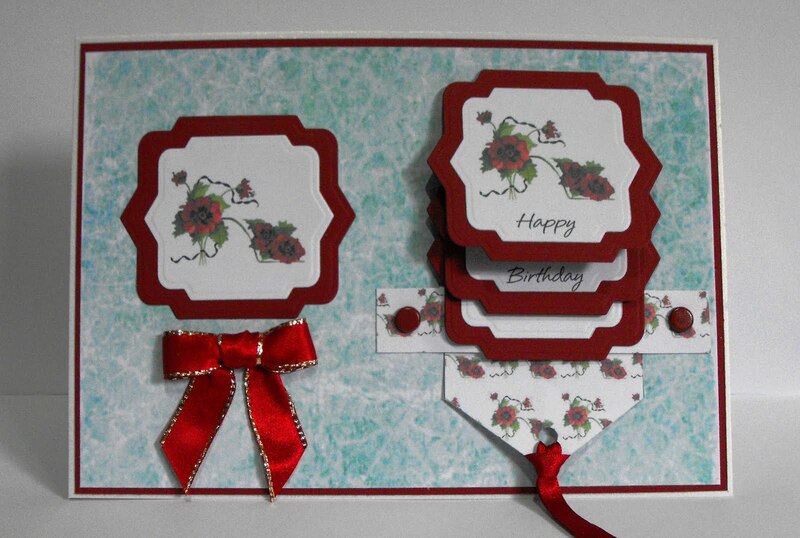 Wow love the colours on this one it is beautiful, I am loving waterfall cards at the moment. Ooooh. This is so very elegant. I love those colors. So bright and rich. Wonderful card and perfect Girlie entry at OPUS GLUEI. Thank you so much for playing with us.